Method: A Nondestructive Testing (NDT) investigation was performed using the Impact Echo (IE) method. 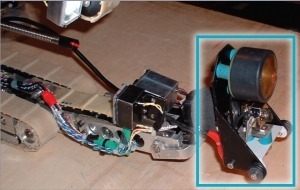 Olson's IE test head was adapted to iRobot's Pyramid Rover which was developed for this special task. Data Collection and Interpretation: The Pyramid Rover crawled up the south air shaft of the Queen's Chamber to the stone door. 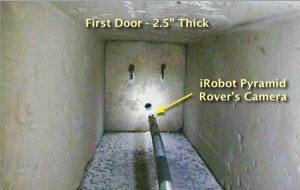 Once at the door, the Rover held Olson's IE head against the stone while the solenoid was remotely activated to impact the stone. The resulting signal was received by the sensor on the IE head and the data was transferred to a computer, revealing that the stone was 2.5" thick. Results: The Supreme Council of the Antiquities decided that the door was thin enough to drill a small hole for camera access. The camera revealed another stone blockage not far from the first. Further exploration will be necessary to see what lies beyond it. To have our equipment used in a place of such historic significance was a milestone for Olson Instruments. We thank the people of Egypt, The Supreme Council of Antiquities, National Geographic and iRobot Inc. for the honor and privilege to be part of this archeological investigation. 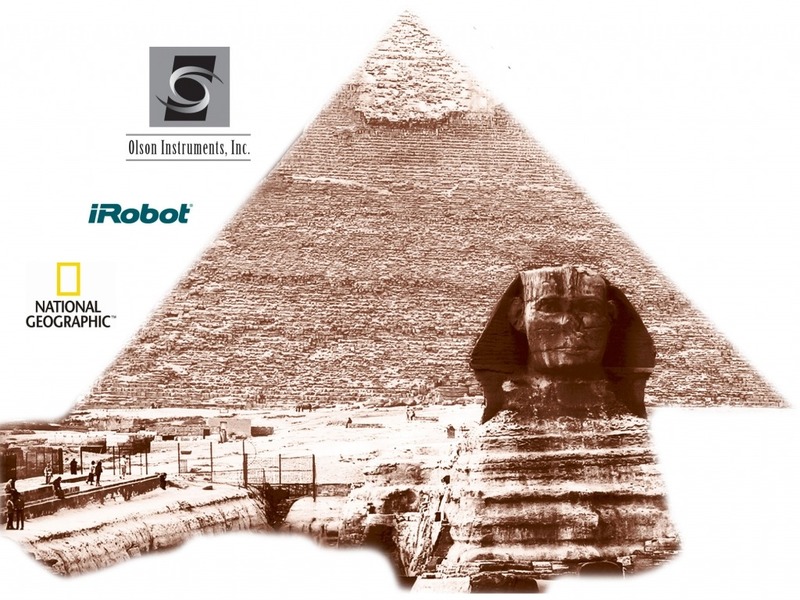 Purpose: On September 17, 2002, Olson Instruments Inc. worked together with the Supreme Council of the Antiquities of the Egyptian Government, National Geographic and iRobot Inc. to further explore the Queen's Chamber in the Cheops Pyramid in Cairo, Egypt. The exploration of the chamber was televised in a Fox and National Geographic special called "Beyond the Closed Door". 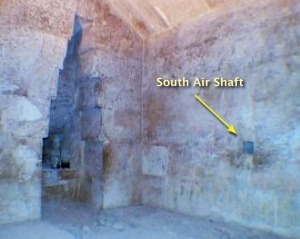 In the early 1990s, a stone blockage of unknown thickness had been found during exploration of one of the pyramid's original ventilation shafts. Two copper hinges on the stone suggested a door and the possibility that there might be a space behind it. Objective: Determine the thickness of the copper-hinged door for the purposes of planning a small drill hole that would allow further exploration.